Purchase a Vigo pull-out kitchen faucet for optimal spout reach and height. Stainless steel finishes with matching soap dispenser all solid brass construction which ensures durability and longer life. Faucet features dual pull-out spray head for aerated flow or powerful spray. Includes a spray face that resists mineral buildup and is easy-to-clean. The pull-down spray wand comes free with a gentle tug and gives you total flexibility. The hose extends and retracts without friction points, fed by gravity. As you raise the wand to dock it, the magnet embedded in the spout pulls the wand precisely into place. So, unlike other pull-downs that tend to droop over time, MagnaTite keeps your pull-down faucet looking picture-perfect. A toggle on a Multi-Flow wand increases the stream from the standard 1.5GPM to a higher flow to more quickly fill the sink as well as pots, vases, or other large containers. Toggle back to 1.5 GPM for normal, everyday use. The innovative Multi-Flow feature can be found on a variety of Delta kitchen faucets. Delta's exclusive DIAMOND Seal. Technology uses a valve with a tough diamond coating. InnoFlex. PEX waterways keep water inside the faucet out of contact with potential metal contaminants. This powerful combination brings you a faucet built to last up to five million uses. Simplicity and elegance are seamlessly fused in the Parkfield Pull-Down Spray head kitchen faucet. Inspired by nature and classical forms, the 14 5/8-inch tall gooseneck design incorporates a 3600.swivel spout that extends upward from a gently curved body. The pull-down spray head, with locking spray control, allows users to transition between two spray modesregular flow and spraywith the push of a button. GROHE SpeedClean protects the spray nozzle against limescale buildup. The rounded side handle, equipped with GROHE SilkMove for a lifetime of smooth operation technology, controls the water temperature and volume with effortless precision. The forward-rotating handle activates the water flow, thus avoiding problems with backsplash clearance. 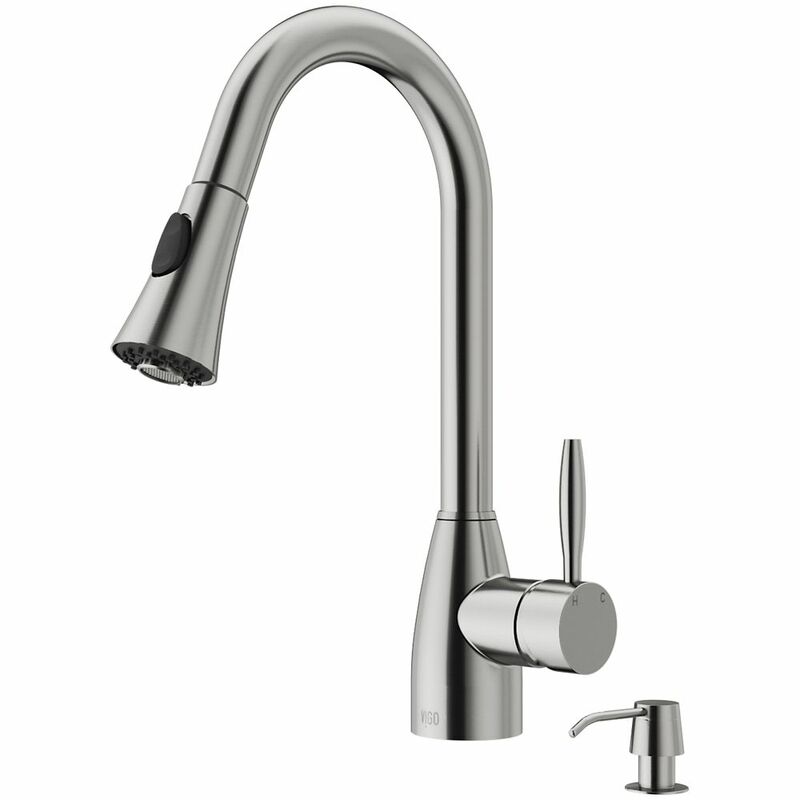 Parkfield Pull-Down Spray head kitchen faucet flows water at 1.75 GPM comes in GROHE SuperSteel InfinityFinish for scratch and tarnish-resistant finish that will last for years to come. Stainless Steel Pull-Out Spray Kitchen Faucet with Soap Dispenser Purchase a Vigo pull-out kitchen faucet for optimal spout reach and height. Stainless steel finishes with matching soap dispenser all solid brass construction which ensures durability and longer life. Faucet features dual pull-out spray head for aerated flow or powerful spray. Includes a spray face that resists mineral buildup and is easy-to-clean. Stainless Steel Pull-Out Spray Kitchen Faucet with Soap Dispenser is rated 4.6 out of 5 by 140. Rated 5 out of 5 by Vickery03 from Love our vigo We currently love our new faucet. We have only had it for a few weeks but makes a huge difference in our kitchen and goes great with our new countertops. It was also very easy to install. We ordered from faucetsdirect. Rated 5 out of 5 by picktown boy from Looks beautiful. Glad to have the new soap dispenser and faucet Looks beautiful. Glad to have the new soap dispenser and faucet We had our plumber install our new VIGO soap dispenser and faucet yesterday. I thought they looked great in the box but once they were installed on the counter they looked fantastic. Even better they work very well. Rated 4 out of 5 by Older Marg from Great looking kitchen faucet for my new sink and countertop I purchased this faucet two weeks ago but only had it installed three days ago along with a new granite countertop and new sink. I love the appearance of the faucet. The only concern I have is the effort it takes to replace the pull-down sprayer. I expected a smoother transition. There is a slight movement of the faucet where it joins the base. Rated 3 out of 5 by SemperSWO from A few issues with part tolerances, I think... I bought this faucet based on online reviews. I can see how other people really liked it, assuming they don't have the same issue that I have with mine... The neck of the faucet "dances around" where it meets the base portion. The handle works great; no leaks or anything, but the neck is disconcerting. I like that that the faucet head snaps into the neck for security, but that means one has to apply a relatively substantial force to take it out of that indentation. Since the neck wiggles around in the base, whenever I pull on the faucet head, the neck shifts around, giving the overall feel of the sink one of cheap quality, or that I've had it forever and have worn it out. VIGO: If there is anyway I could've done the installation improperly and you guys get complaints like this often due to that, please contact me and let me know how I can remedy the situation. Overall, I feel like the product is quality, which is why it doesn't make sense that I'm having issues with something that I would only expect from a cheap product. I will update my review if I can fix the issue. Thank you for your time. Rated 5 out of 5 by Prudence from Super product Just installed this faucet 2 days ago and I love how the hot/cold handle hangs over the sink so there is no wet hand drips on the counter top to clean up. The sprayer clicks on very easily and the weighted hose works super. I love this faucet! Rated 5 out of 5 by grunberd from 5 stars for the customer support I purchased this faucet (VG02013ST) as part of a bundle that included a stainless steel sink and soap dispenser. I've had quite a few problems with the faucet and soap dispenser. I bit the bullet and called Vigo customer support and I have to say, they were exceptional. They are sending me replacement parts for everything that went wrong and are available to hold my hand if I need assistance during the re-installation. I wish they had better visuals (drawings of the parts and how to assemble them, or videos), but I'm sure it will all work out. They are definitely a company that stands behind their products. I'm really impressed. Rated 4 out of 5 by Michelled from Great Faucet! We had to replace our old faucet and looking up all the different faucets this one seemed to get really good reviews! The only downside I have to it is it seems a little tough to push the nozzle back in; I need to use two hands to make sure it is lined up properly.